Aqua Seal is a dual component hydrophobic polyurethane water stop system designed to stop high infiltration in precast or brick lined structures. Aqua Seal is highly reactive (3-5 seconds) and can stop leaks in excess of 50 G.P.M. 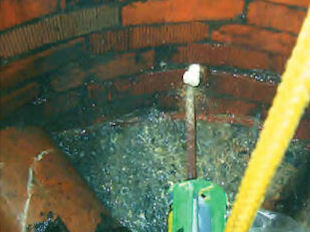 Aqua Seal is pumped under pressure with a caulking gun and can be injected into flowing water. Aqua Seal comes packaged with twelve 600 ml dual component urethane caulk tubes along with twelve static mixers. Since only a heavy duty dual component caulk gun is required, cities can easily install Aqua Seal with their "in-house" maintenance crews. A user-friendly pneumatic gun is also available to provide a faster and more efficient installation.